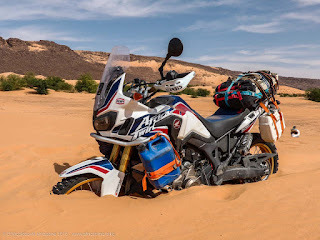 Note: this article is the English translation of a post on our experience with the new Africa Twin (base version: no ABS, TC and DCT) on a recent trip in Mauritania. You can find the full report in our homepage. Leaving for Africa for an overland trip with a motorbike that just made its first appearance in showrooms is a gamble. Reassuring as the name “Africa Twin” may be, it’s just a name, nothing like a guarantee of reliability. After coming back, we can say straight away that our experience in Mauritania confirms the impression of a sound project. The bike handled everything we threw at her just fine, got back home with no significant problem, and was a pleasure to ride. There’s no doubt she passed our test very successfully - though not always at full marks. No major problem. No problem with African petrol, often of questionable quality (we got it of any colour – red, green, yellow – from jerrycans and drums). The engine did not burn any oil. After the first 50 km of serious offload we lost one fairing bolt (one of the four located close to the tank cap). However, our fear of loosing the bike on the piste piece by piece vanished quickly: no other part got loose afterwards. On a very stony piste, the sidestand springs got unhooked. Luckily we did not loose them, and simply hooked them back at the first stop. Not a big deal, but that can be dangerous, so it’s definitely a detail worth some fix. That’s apparently a real issue, not just bad luck: it was reported to have happened to Ugo Filosa during the Hellas Rallye. The air filters did not get particularly dirty. We were just two bikes, so we never had to ride in each other’s dust cloud; still, the desert calls for special attention for air filters. 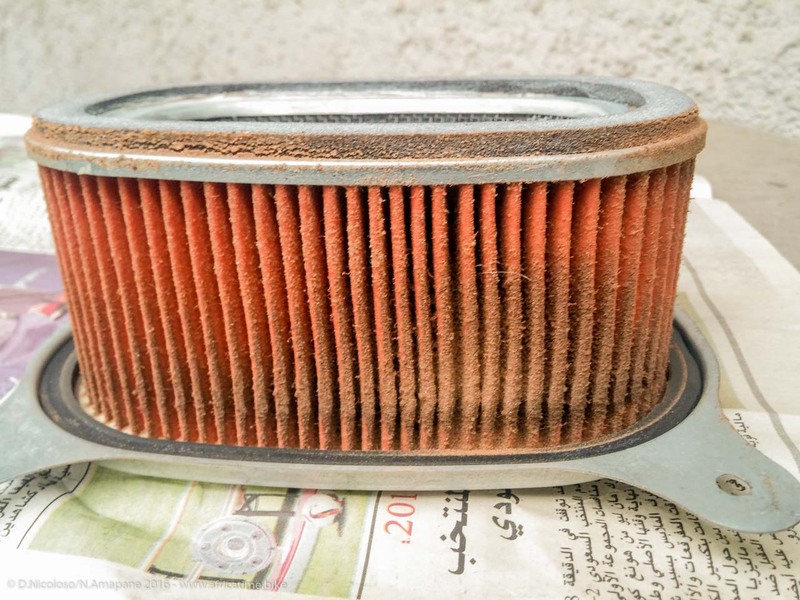 On the CRF, the air intakes are strategically located in a high and advanced position, so they don’t collect dust from the wheels, and don’t become clogged up. That’s good news, since removing the fairing to clean or replace the filters is a long and tedious matter on this bike. 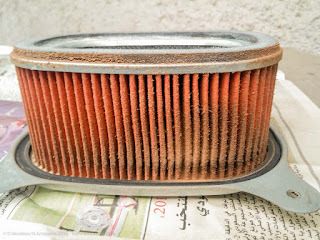 Here’s a picture of the state of one of the two filters of the CRF at the end of the trip, compared with the XRV’s filter. Fuel range was a recurring worry for our whole trip. The tank is beautiful, but too small: for a bike pretending to be an African cruiser, 18 liters are simply not enough. There’s little room to fit extra tanks, and once we saw the complex structure of the tail and rear fairing we gave up with the idea of building custom rear tanks in time for our departure. We just fitted a 5 l Acerbis tank on the left side, which was anyhow not enough to reach peace of mind. 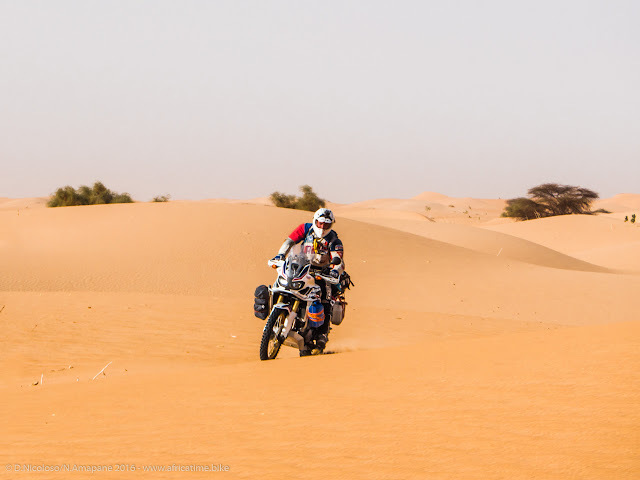 On sand, the bike claims 9 to 15 l per 100 km. On tarmac that was 5-6 l per 100 km. Next time we’ll definitely fit large rear tanks somehow. The engine is there and when you need it, it delivers. 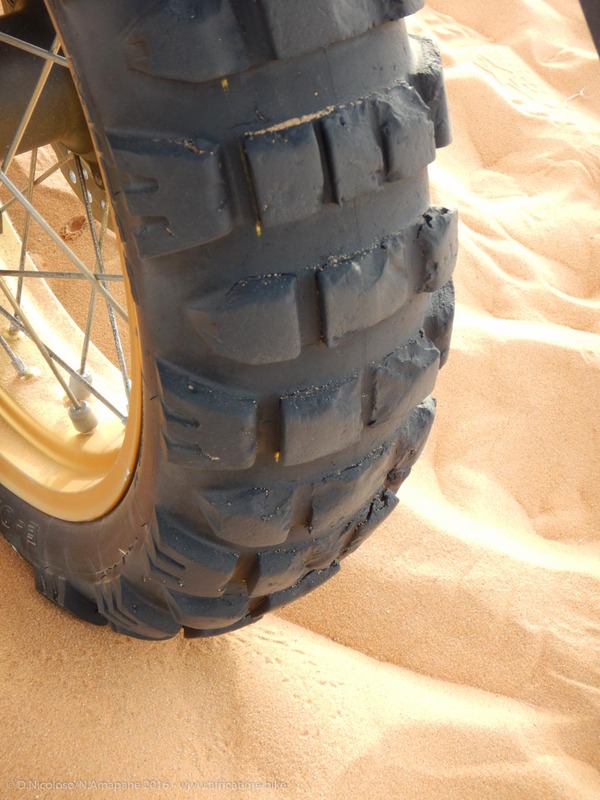 Even without a chassis dynamometer, you can feel the 95 hp when riding in the sand: the XRV pales in comparison. But there’s no “big bang”, no feeling of an explosive power. It does not tear your arms off: no emotion, no adrenaline rush. Still, there’s plenty of power down there. On steep stony slopes, the bike climbs without feeling like a crazy horse, so at the end of the day our arms were thankful. Despite the impression of a smooth power output, the hps did hurt our rear tyre, which was completely over in just one week, even if we were riding rather conservatively. On the XRV, suspensions were a sore spot: they are universally considered the first thing to replace or upgrade. We were fully loaded - besides 80 kg of driver with almost 20 kg of armour we carried luggage, spares, tools, tent, food and water. Frankly, we were expecting the stock suspensions to be a pain. But to our surprise, they did remarkably well, on any terrain. We did not even feel the need (nor have the time) to play with settings, though we realized that a bit more preload would have been an improvement. Personally, I would have liked the footpegs (and thus the whole bike) to be 10 cm higher: I prefer to touch ground only with the tip of one foot when standing than hitting rocks with the boots when riding in harsh terrain, as it happened. The front rim got back undamaged. 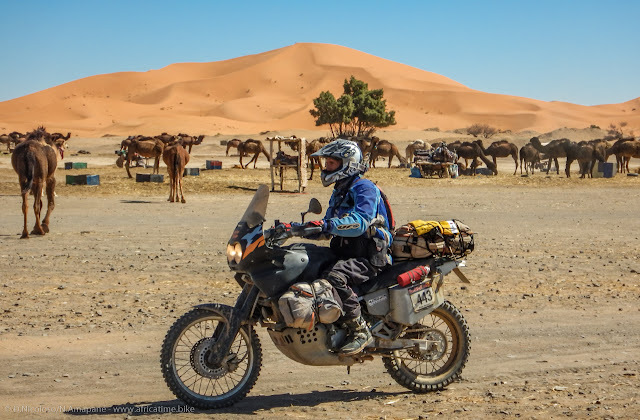 Nobody in his right mind would take a catalyser for such a trip and we are no exception, but despite searching, we could not get our hands on an aftermarket exhaust in time – not even a pre-production sample with the promise of stress-testing it. So, we convinced ourselves that our mission was to find out how the stock one would behave. To our surprise, it did well. Despite being enormous, it does not hinder, it does not get scratched when laying the bike down, and it does not overheat. Apparently, it is not even particularly heavy (it’s reported to be 4.8 kg). 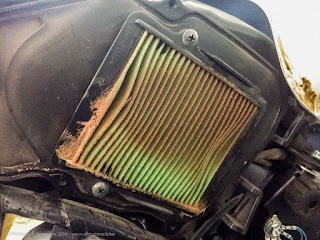 Hence, replacing the stock exhaust with an aftermarket one is mostly a matter of aesthetics and of sound – and there’s admittedly margin for improvement in both fields, for whom that matters. As a side note, the stock exhaust leaves little room for a rear tank on the right side, while some of the aftermarket terminals that can be seen on the net are tighter and would allow plenty of room for that purpose. The LCD display provides a wide range of information. Maybe not everything is essential, but it’s fun to have all that stuff to read. On road, the speed reported on the display is irritatingly optimistic compared to the true GPS speed. That gets even worse while driving offroad: speed and fuel consumption are computed based on the rear wheel’s RPMs, so they are ridiculously wrong (at least on the “base” version that we used; we wonder if that’s the case also on the other versions, since they are equipped with a rotation sensor on the rear wheel for the ABS system). Our best advice here is to practice the disassembling sequence at home. It is illustrated on this excellent YouTube video. Fairings are fixed with a system that is more suited to a big scooter than for an off-road bike. They require a lot of time and care to disassemble and reassemble. This is something you definitely don’t want to have to do in the middle of nowhere. The rear fender and carrier are not modular, so that any modification (e.g. to fit large rear tanks) is problematic. The rear brake pedal, the gear lever and the right footpeg support are made of cast aluminum, which can easily break as a consequence of a fall (this happened to Motociclismo Fuoristrada’s testers as reported in the February 2016 issue). Old-style steel would have been a better choice as it bends without breaking. Likewise, we don’t like the cast aluminum side stand, which cannot easily extended or have a wider foot plate soldered. The loss of windscreen rubber fixings inside the depths of the front fairing, which we described in one of our early posts, is a sort of rite of passage every CRF1000 owner has to undertake. The tool box is simply ridiculous. 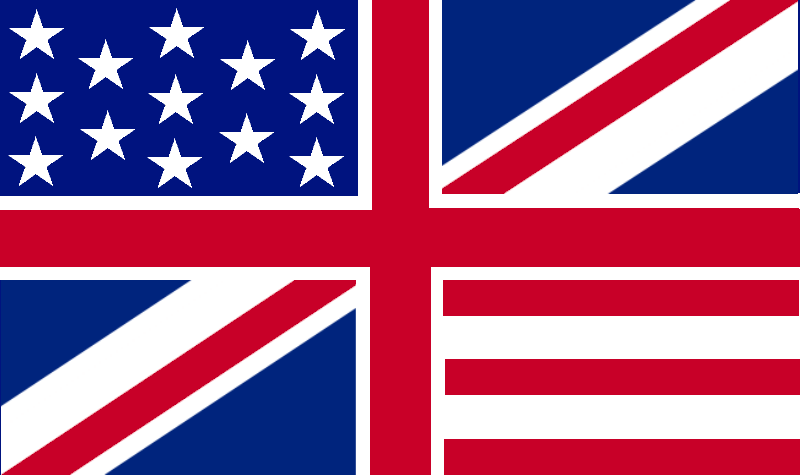 We would jail the guy who could imagine, design and approve such a colossal failure. It’s tiny, it’s uncomfortable, and to open it you need a hex key that by logic should stay inside it. Getting the hex key under the seat, disassembling the box and reassembling it afterwards is too impractical for an offroad trip, where tools are used on a daily basis. As already mentioned, the tank is small. The front fender is too close to the wheel (as actually on all modern bikes in this market segment). We think the front brake lines are a bit too exposed. 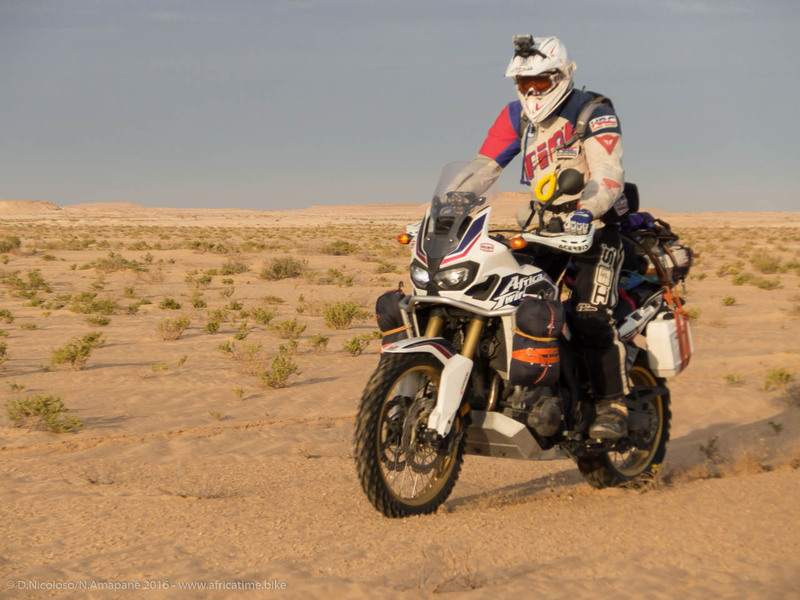 Still, the bike behaves very well in the dirt and is very reliable, as we could verify during our trip. We like the particularly quick and hassle-free removal and reassembly of the front wheel, which is much appreciated when you get a flat tyre under the desert’s sun. Also, we like the split seat (the driver’s seat can be removed even with a large soft bag that extends on the pillion seat).The bar over the dashboard is very handy to mount a GPS. We fitted Honda’s original crashbars, since they were the only ones readily available when we left in February. They’re very expensive compared to aftermarket ones, but we eventually liked them: they are made of a single piece (unlike all other competitors), and are very light. They don’t form a very rigid system, which is disappointing at first, but that can possibly be an advantage. We used the bars to fasten two bags in the beginning, and two 5 l plastic tanks for fuel later on. Apart for scratches, they did their job well. Aesthetically they are questionable, but we can say that they worked fine. We fitted some generic handlebar risers and cheap Acerbis closed handguards. We did not have time to look for find perfect solutions, and we’ve to say that those we used don’t fit very well. Since we did not modify the suspensions we did not have to extend the side stand, which would have been problematic given it’s made of aluminium. We just added a larger footplate, bolted on two holes drilled in the original foot. We also enlarged the footpegs, which are too small and short, soldering an hand-crafted iron extension. (More details on the bike preparation can be found on the technical section and in this post). 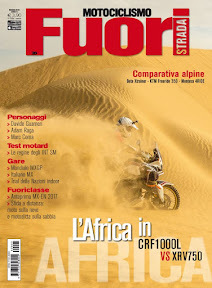 To sum up, the CRF1000 is a robust and reliable bike that can be a good base for long-range overland travel, as one would expect from a true Africa Twin. However, several details are not up to the philosophy of a bike made for adventure, which so proudly fill Honda’s ads, and are not very practical for overland travel. “At that time we pissed ourselves from laughter. What, ten years ago, stood in the dealers’ showrooms and shortly after on the parking lots next to our beloved XTs, looked like a colourful plastic heap. Overweighed and monstrous, blinding and exhibitionist. A showmobile for a ride to the café or the disco, but no Enduro to conquer the world’s gravels. A real biker would have never climbed the saddle of an XRV 650 by free will. We were pretty sure about that. And just one month after her release the Honda got its nickname ‘Ape-Twin’. In our eyes, this bike was bound to failure. But you couldn’t get rid of her. Catching a glimpse on her two-eyed face in our single-cylinder tattered rear-view mirrors, you were just seconds away from hearing the brawling V-Twin sound passing you by without any sign of hesitation. We hope that in 10 years from now we will smile in the same way about the time we were thinking the DCT to be absurd, or the offroad attitude of this CRF1000 to be questionable. 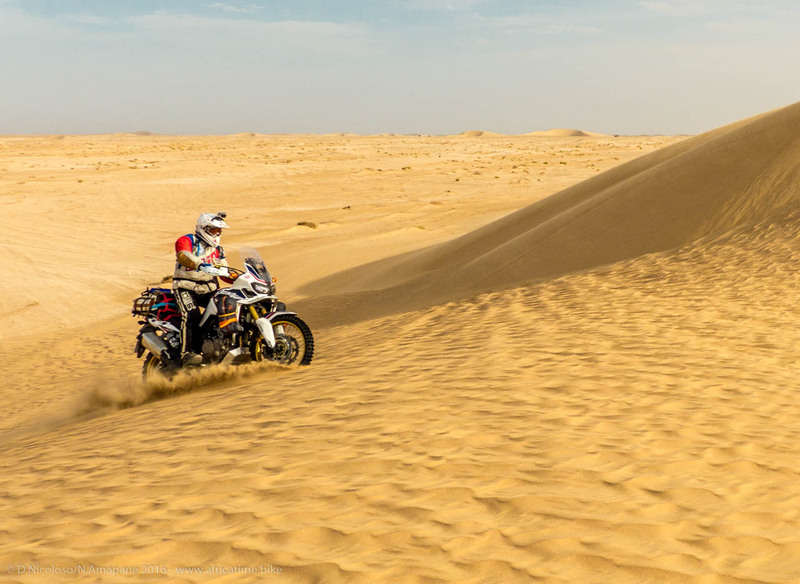 And in fact, at the end what really matters is not much to have the ideal bike, but rather to have the desire and determination to jump on the saddle and to leave. And we proved that if these are not missing, the CRF is ready to do her part. Thanks for your AT evaluation! Very interesting comment... I've added a map at the end of the page; in the trip itself we covered something more than two thousands kms (in addition to 1 thousand for break-in done at home, on road, before leaving). That was mostly harsh terrain and was a test for suspensions under various conditions, but admittedly not enough for testing their long-term stability. However, after coming back and riding the bike on road without luggage, Davide (who was riding the CRF in Mauri) had the impression that suspensions had become a bit softer, possibly with a larger static sag. It's just an impression and surely within what can be corrected with settings, so we didn't give too much weight to it, and didn't report. But from what you say it's maybe worth a more quantitative check. We will compare with my CRF, which was bought together with his one but remained at home, so is still as new. In the meanwhile, can you provide more details on your experience? how many kms exactly, what kind of terrain, what symptoms? Did they just change the oil or do a full rebuild? And how did they justify the need of servicing after so few kms? Fantastic! Thanks for the great english translation. Did you get unlead petrol in Mauretania or did you use lead petrol with your catalyst and oxygene sensor installed ?? Thanks! The bike arrived just a few days before our ferry was scheduled to sail (in Feb 2016, it was one of the first CRF1000 batches to get to the Italian market). We had queried some aftermarket exhaust producers beforehand in the hope of replacing the stock one, but nobody had it ready in time. We also had no time to even consider removing the lambda sensor and/or the catalyst, so we just left it as it was, and threw in any petrol we could find on the go. Leaded is in principle no longer to be found in Mauri (cf http://www.unep.org/tnt-unep/toolkit/Actions/Tool9/), but who knows when it's sold in jerricans or drums. Anyhow, leaded would ruin the lambda sensor, which gives feedback to the ECU to adjust the air/fuel mixture, so one would expect the engine performance to be affected, which apparently did not happen. In any case, removing the lambda sensor altogether would affect performance in the same way... I'm not an expert but I don't know if there's any solution or workaround for that. OTHO removing the catalyst to avoid spoiling and replacing it with a plain pipe hosting the lambda sounds a good idea in principle (at least given my poor knowledge of the matter), but we were told that doing that would require a different ECU mapping because exhaust would be let out at a higher speed. Not sure if that's true, it would be nice to hear from somebody who has tried for real. Thanks a lot for your answer Nicola. I've read in a German blog (Pistenkuh) that there is only leaded fuel in Mauretania, obviously wrong information - that's the reason for my question. will convert. So the next time someone lands on your site as the result of a Google search, put your best foot forward by offering great design and quality content.